While less diverse than Caenogastropoda and Heterobranchia, the clade Neritimorpha–which has ~2,000 extant species–is also ecologically diverse, with members occupying marine, freshwater, and terrestrial habitats (Uribe et al., 2016). Similar to both of these larger clades, slug- and limpet-like forms have also independently evolved within the Neritimorpha (Uribe et al., 2016). Some marine genera of Neritimorpha are associated with particular marine environments; for example, Smaragdia occurs in association with seagrass, while Neritina lives in brackish water environments (Costa et al., 2001). Finding these same taxa in the fossil record therefore is very useful for interpreting past environments. 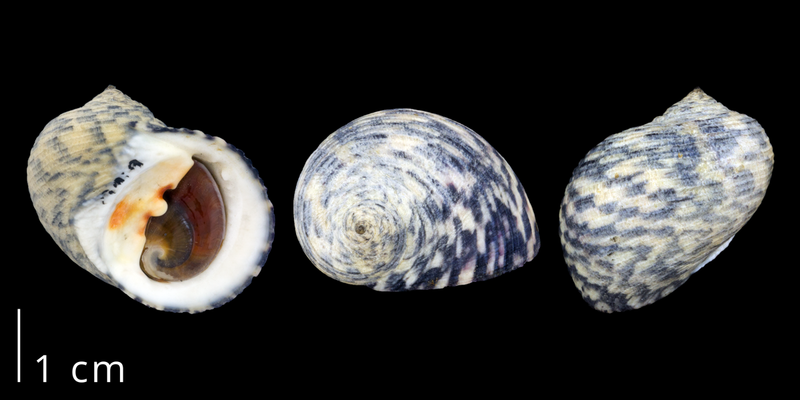 Modern Nerita peloronta from Bermuda (PRI 70104). Note that the operculum of the shell is in situ. It is estimated (Zapata et al., 2014; Uribe et al., 2016) that Neritimorpha originated sometime in the late Paleozoic and may share some degree of relationship to the platyceratids (Frýda et al., 2009), which were important gastropods in the early Paleozoic. Gofas (2009) recognizes the following gastropod families as members of the Heterobranchia († indicates extinct families). This list was copied from MolluscaBase on February 7, 2017 and is reposted here in concordance with the source material’s Creative Commons BY 4.0 license. The link associated with each name will direct you to additional information about that family on MolluscaBase. Family Platyceratidae Hall, 1879 †; learn more at the Ordovician Atlas. Costa, F. H. A., R. H. Nehm, and C. S. Hickman. 2001. Neogene Paleontology of the Northern Dominican Republic 22: The family Neritidae (Mollusca: Gastropoda). Bulletins of American Paleontology 359. Frýda, J., P. R. Racheboeuf, B. Frýdová, L. Ferrová, M. Mergl, and S. Berkyová. 2009. Platyceratid gastropods — stem group of patellogastropods, neritimorphs or something else? Bulletin of Geosciences 84: 107-120. DOI: 10.3140/bull.geosci.1125. Gofas, S. 2009. Neritimorpha. Accessed on February 7, 2017 through: MolluscaBase at http://www.molluscabase.org/aphia.php?p=taxdetails&id=156484. Uribe, J. E., D. Colgan, L. R. Castro, Y. Kano, and R. Zardoya. 2016. Phylogenetic relationships among superfamilies of Neritimorpha (Mollusca: Gastropoda). Molecular Phylogenetics and Evolution 104, 21-31. DOI: http://dx.doi.org/10.1016/j.ympev.2016.07.021.